Project Silver Bug was the American “Black” project version of the Avro Aircraft Canada Y-2 undertaken by the United States Air Force in 1953. Project Silver Bug was a code name given to an experimental saucer-shaped aircraft in the 1950s built by Avro Aircraft Ltd. in Malton, Ontario, Canada for the US military. 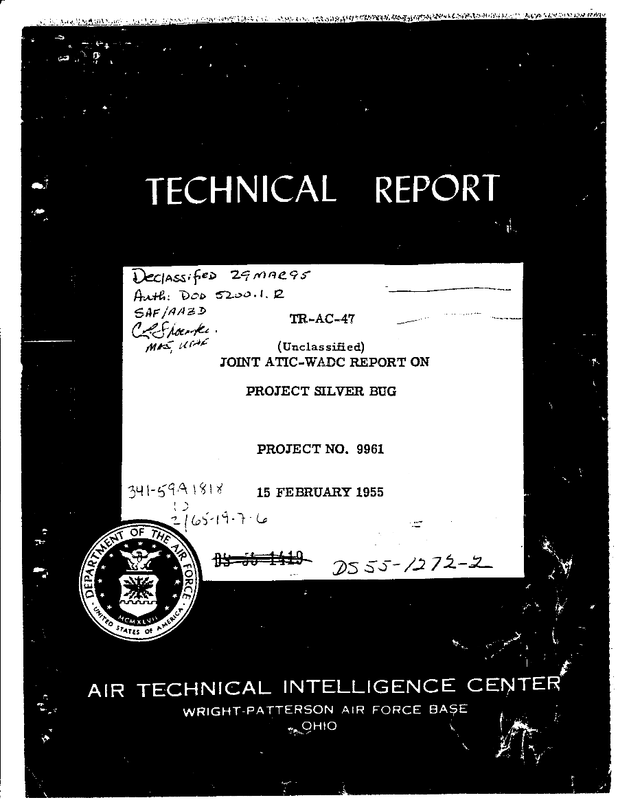 The high security surrounding the project led to conjecture that the Americans were using the cover of Project Silver Bug to test alien craft that they had captured. Project Y-2 was begun by the Canadian John Frost, who was apparently in the loop on Nazi Saucer programs and was quite fascinated by them. It involved a “radial flow jet” engine design which was simply radical for 1955. As late as 1976 people were copyrighting ideas essentially identical to this 1955 design (see US Patent # 4,193,568). This aircraft was listed as being capable of over 80,000 feet and Mach 3 and able to hover at up to 18,000 ft. without using afterburners. Due to newspaper leaks in the mid 50’s a cover story for the Y-2/Silver Bug program was leaked to “Look” magazine which, while broadly similar, disinformed the public as to the radical engine (substituting many small conventional jets for the single radial flow) and the control systems to be used. Later in 1958 Avro Aircraft Ltd. was contracted to build a somewhat similar, small ground-cushion vehicle reminiscent of the “Look” magazine item for the USAF and US Army. I too am convinced that this “Avrocar” was constructed only for disinformation purposes while Y-2 went “Black” as a means of providing the US Gov’t with “plausible deniability” and also the possibility of telling those who saw “flying saucers” that it was only that Avro vehicle. The strongest evidence that Avro built something to resemble Y-2 comes from 5.4 million dollars spent on Avro’s own “Private Venture 704″ including about 2 million dollars from the USA up to 1957. The Avrocar project was commenced after this time and used only 4 million or so to completion. Avro stated themselves that the first step in responding challenge of developing the Y-2 was to build the engine and the control duct system. Clearly this is where the first 5.4 million dollars went. With all that money came rumours and the Avrocar would be a great way to dispel them. Meanwhile with the Avrocar, the project used a much less sophisticated arrangement in a much slower and lower flying design. It did prove the control system devised for the Y-2/PV 704/Silver Bug and provided publicly acceptable “proof” of the flying saucer design. It was also used to proved “proof” that the concept was not feasable. The intial test flights revealed it was underpowered, unstable and could not transition to proper forward flight. Interestingly, recent films show the solved the instability problem. There is testimony on the record that they also finished doing modifications required to allow the craft to transition to forward flight (after which it was expected to be capable of 300 mph). This is the date the US money disappeared and the project was terminated with all drawings, tooling, and flying examples taken to the USA. The examples at Wright Patterson and in the Smithsonian are NOT the final Avrocar version but early development models that were far from successful.